It’s almost the start of a brand new year, and that means it’s time to make your marketing plan. There are customers out there who are looking for your business, so what are you doing to bring yourself to the forefront and #BeAwesome? There is power in storytelling, and your brand story is essential to gaining the advantage of your ideal market. Your real story, the pains you are solving, the struggles you’ve faced to be able to help them with their pain points…all of this is essential to a solid brand story. Your customers want to know who YOU are, and what YOU can do for them. It’s time to put yourself at the forefront of your brand. What is your company’s origin story? Where did it begin? Where is it headed and how do you plan to get there? What significant events in your life and company’s history lead to where you are now? What pains have you overcome to succeed, now? What drives you to help others overcome those same struggles? Your audience is tired of seeing generic platforms that try to sell to them constantly. They want a personal touch, a way to connect with a real human on the other side of the screen. Showing them the work behind the scenes is a great way to build an emotional investment in your viewer. People relate to the stories of other people. Remember that you’re the face of your brand. If you’re late or slow to comment, that’s also a part of your brand. You should put your best (and most professional) foot forward. That doesn’t mean you have to use stilted language and respond like a robot. It does, however, mean that you need to put out professional quality and accurate information. A key point to remember is that a live video Q&A, training, etc. doesn’t mean a last minute production. Create quality content and you’ll gain the trust of your audience. As a side note, consider adding a section to your site that highlights your most popular articles, products, or services. This gives your potential customer/client a great place to start. 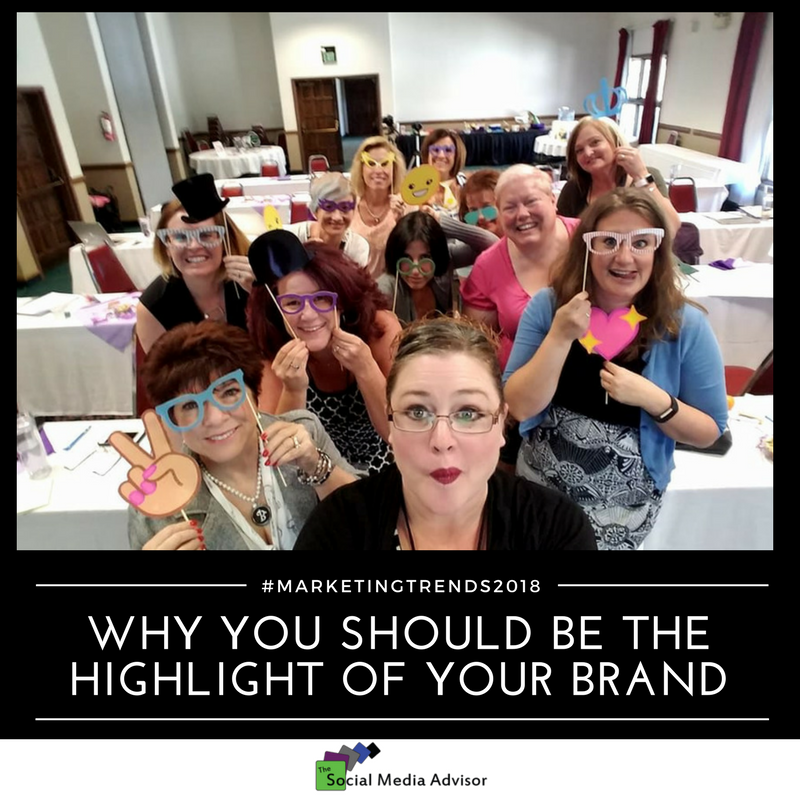 Shining the spotlight on these valuable posts and services will showcase what your brand is all about. Using the title “Most Popular” can have a great side effect of showing an active brand community. It’s a new year. Use this time to ensure that you have the YOU in your brand. Recommendations and word-of-mouth are still the most powerful way to gain new clients. Unfortunately, that recommendation won’t happen unless you encourage them to tell your story. After you complete a project for a client, ask for a recommendation, referral or testimony. This shares your story with your audience on what it’s like to work with you. If the idea of asking for a recommendation, referral or testimony makes you uncomfortable, remember this: people won’t give their referrals or recommendations unless they love the work you do for them. Most people don’t even consider giving them because they don’t know what they are. Here are some great ways to break the ice and get the love from your happy clients…without coming off as sleazy or pushy. Whenever a customer compliments you, give them a quick and sincere thank you. Let them know how pleased you are that they’re happy and then ask if they know anyone else who could benefit from your services. This is a referral. Referrals can also come from other businesses. Set up a referral business with a complementary company. If you are in the web design business, for instance, you could set up a referral service with a hosting company you trust. That way you can both offer incentives and discounts to encourage additional business. If you’re not sure where to begin, think about the additional services your clients and customers need once they’re working with you. Another way to gain referrals is by setting up a commission. If you’ve ever signed up for an affiliate program, you’ve done this already. Amazon does it and so do many successful entrepreneurs. A person who has signed up for your commission program shares your product or service. They have a special signup code or affiliate link to provide their viewers, customers, etc. Once a person takes your offer through their connection, the referral member gains a reward. It can be a percentage of sales, product discounts, or free products after so many referrals. Make it easy for your clients and customers to leave recommendations and testimonies by creating an easy-to-navigate system. Setting up an online form through your website, for instance, really makes it simple, and gives them time to formulate their testimonies. You can provide a sample template to get them started. Share all of your goods and services with them, so they know what else your business can do. 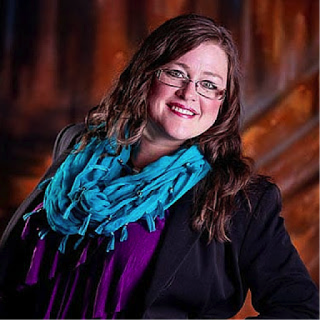 Treat your clients as partners and key players in the success of your business. They want to know they’re important to you. So let them know how much you appreciate them! After you get through a difficult situation with them. Upon completion of your service. When they mention their appreciation of your company and the way you do business. You are in the business of helping people, and the people you help want to share that experience. Making it easier for them to do so helps you both in the long run. Someone out there needs your help, and an awesome story about your company may be exactly what gets them to you. 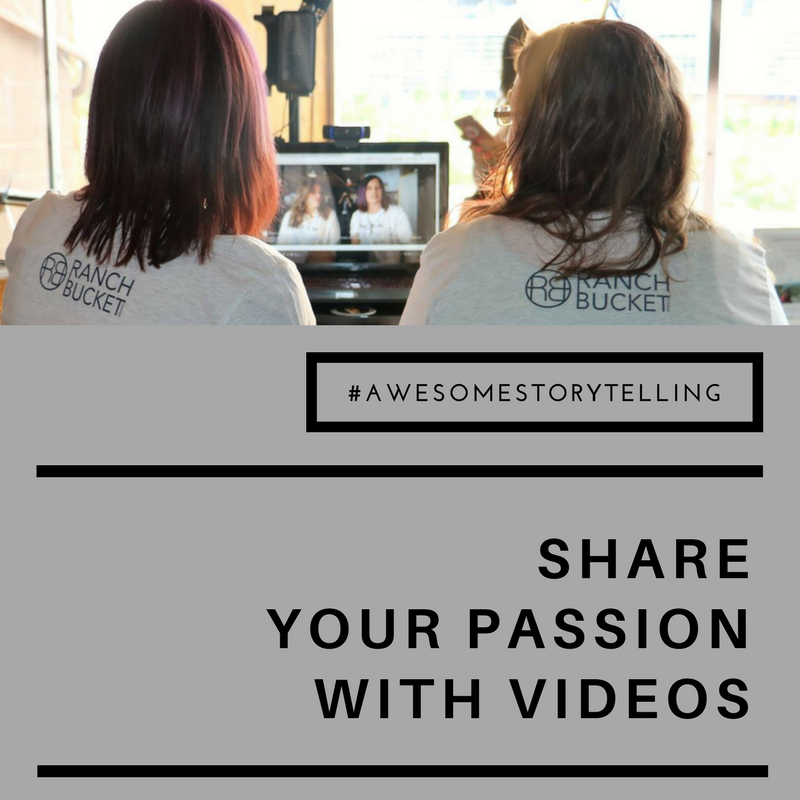 One of the most effective ways to get your audience on board with your passion is by making great storytelling videos. With social media giants like Facebook and Instagram pushing video content, now’s the time to connect visually with your viewers. With awesome storytelling, of course! An infomercial will turn off your readers, but a compelling story will keep them hooked. Stories are great ways to teach, engage with, and create emotional responses in your audience. You don’t have to sit in front of the camera and talk for ten minutes. As a matter of fact, that can actually be detrimental to your video’s success. Instead, incorporate other visuals that help tell your story. You can use regular things like slides, but also consider recording additional footage that enforces your story. This is called B-Roll, and it’s wonderful. If your passion is horses and horse rescue, showing B-Roll footage of horses running at dawn, or the recovery efforts of a recent rescue can lend power to your voice. Here is a fantastic video by filmographer Peter McKinnon on how to incorporate B-Roll in your video. Some key takeaways are to use your B-Roll to help tell your story, think about how your world is a part of your passion, and use it to make your story more powerful. If you’re camera shy, you can develop videos that incorporate B-Roll, slides, and more with a voiceover by you. You can also take advantage of platforms and the way they push videos. Instagram Stories, for instance is a great way to show your daily passion through video. Jesse Driftwood is an excellent Instagram Stories user, and he gives some incredible tips on how to take your storytelling to the next level. Keep in mind that Instagram Stories are temporary, but you can create the video with whatever software you choose and then upload it, so your Stories stay with you. You can release them on other platforms, as well, but the daily connection with your passion can be told through daily footage, excitement for your day, and, as Jesse says, by making everyday things in your life a “character”. A story has a beginning, middle, and end. Whether it’s ten minutes on YouTube or fifteen seconds on Instagram Stories, you need to follow this logic. A cliffhanger now and then is okay, but do it too often, and your audience will become exasperated. Music is necessary. Make sure you adjust the volume levels appropriately, and that the music fits the story you tell. Shoot video footage with as much stabilization as possible. There is nothing more jarring than shaky cameras. There are some amazing phone and camera mounts out there. If you create “selfie” types of videos, make sure you have three points of contact with the stick and you’ll see a huge difference in the shakiness factor. You can also try a stabilization system like steadicam or any other type of gimbal device. Basically, it uses counterweights to keep your video steady so you can walk, talk, and without the jarring stepping motions. Put your best foot forward. In video, appearances are just as important as content. So make sure you’re camera ready before you begin. That’s it for video storytelling! What kind of video did you want to make? Are there any areas you’d like me to expand on? Remember that telling your passion in the form of storytelling is just one way to be awesome in storytelling. 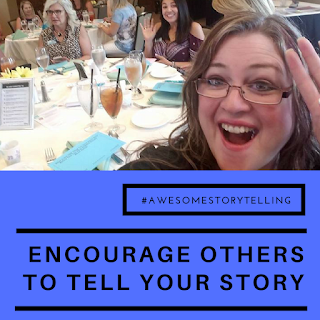 #AwesomeStorytelling – Share Your Triumphs! 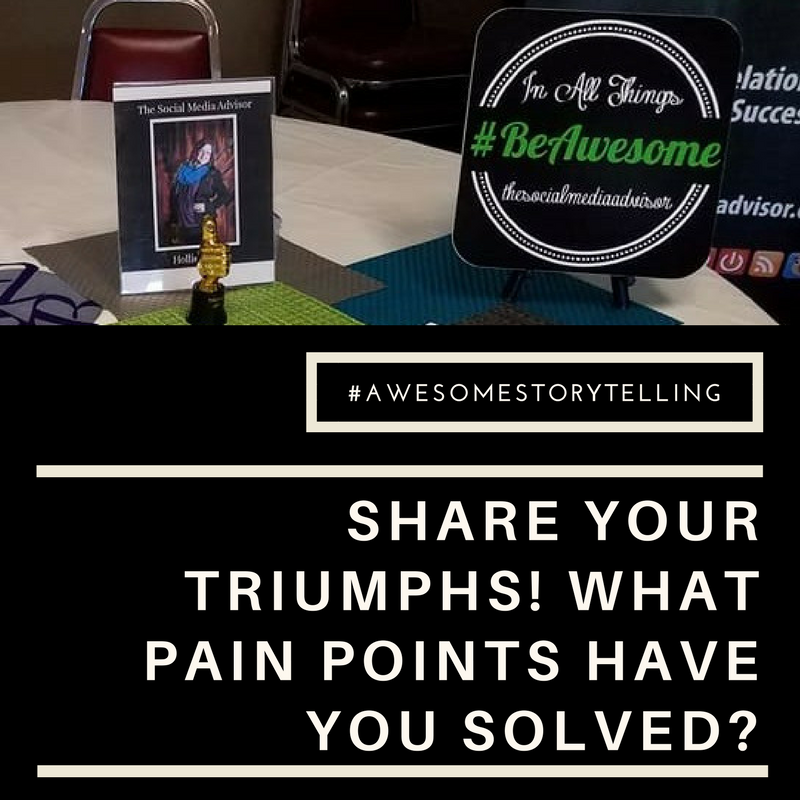 What Pain Points Have You Solved? The trick to telling your brand story lies in understanding that followers are more interested in themselves than they are in your company. You might have an engaging story full of action, compassion or impact but the key is telling it in a way that inspires, motivates or empowers the reader. It’s not a new concept in marketing – the idea is to highlight benefits, not features. How does what you provide benefitthe client or consumer? Getting inside the head of your audience means first understanding who your target audience actually is. Once you’ve figured that out, you need to find out how to reach them. One way to do that is to uncover their pain points. People make purchases for a couple of reasons mainly for either pain or pleasure. Parting with our money means making tough choices. Is it worth the enjoyment I will get out of it? Or will it solve a problem that I need resolved? If you can convince the reader that you are a solution to a problem causing them pain, then the battle is already over. 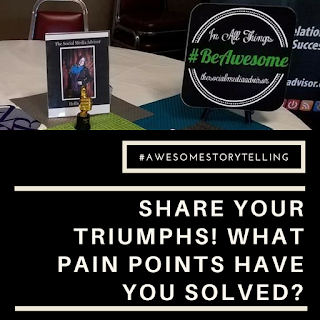 When crafting the stories you will share with the world, are you showcasing how your product or service will ease their pain and solve their problems? Don’t assume that putting together these case studies comes off as bragging or tooting your own horn – a well-crafted tale will be about the happy client and not the company. It is also all a business needs to close that next sale. Exercise your storytelling abilities by demonstrating your success and triumphs in your content and social media. How many ways can you spin this yarn? Post the case studies onto your website for easy access. Be sure to incorporate your willing clients so that followers can get the perspective of your pleased customers. Make a video with your satisfied client, interviewing them or just asking them about their experience with your business. Collect testimonials and post them everywhere, create custom graphics to share these moments in your social. Turn the case studies into blog posts that you can post and share. Create a presentation filled with these stories that you can post on Slideshare or rotate on a screen at your place of business. The opportunities are endless for demonstrating that your company provides solutions! It’s time to let people know that you exist to fill a need and that you are passionate about the services you provide. You can preach about your products and services, and how wonderful they are, all day long but that doesn’t mean your audience cares. Give them a reason to care by showing them how hiring you will make their lives better. That’s how you elevate your brand and continue to #BeAwesome at what you do!